Finished up this sample quilt for Ali based on her paper pieced pattern for the equation y=1/x. There are a couple of firsts in this quilt for me. It was the first time I've made an entire quilt from a paper pieced pattern. 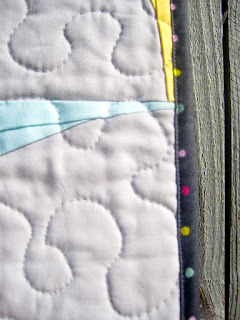 It's the first time I've used 505 to spray baste a quilt--by the way, I think I'm in love! It's also the first time I've used the start/stop function on my machine to free motion instead of the foot pedal. I've always wanted to try it, but if you pin baste, the start/stop button isn't practical. I'm still not sure I would ever take the time to spray baste a large quilt, but it was sooooooooo much faster to FMQ this since it had been spray basted I might consider it! I used some Habitat for the binding since it had a lot of the colors I used in the top. The back is an AMH flannel print. It's super soft and cozy! I love how the quilting show up on the back! I'm now working on a stocking for my nephew! I still have to add the cuff and add some details to the other side. Love the quilt too. That back does look super cozy. hey, is that the stocking pattern you won at the meeting? quilt looks great! i ONLY spray baste! 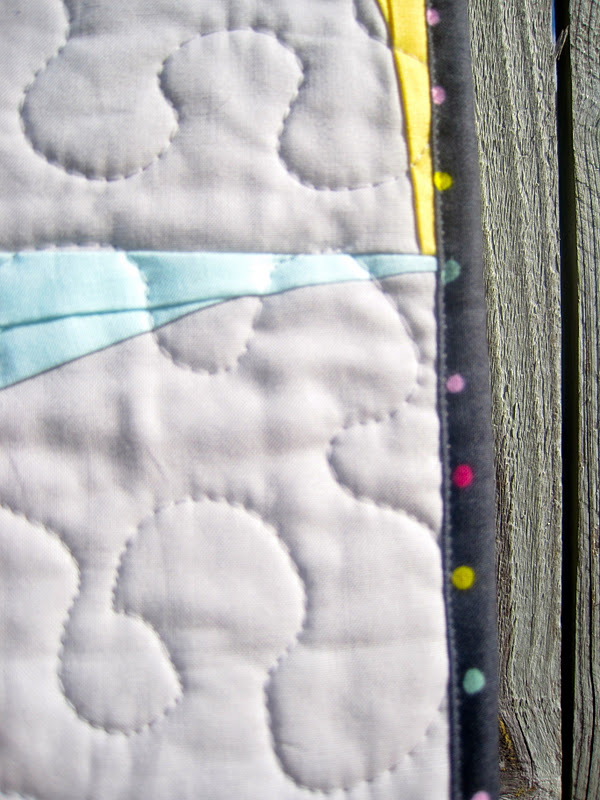 Fantastic little quilt and congrats on the 'firsts'! I haven't used that start/stop button much - tell me more....And what a fun looking stocking! Can't wait to see it done. 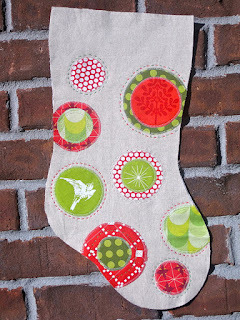 Such a great stocking - I think I made the reverse of it a couple days ago - porthole type blocks out of crazy christmas fabrics, with mostly solids poking through the holes! lol. very cute everything. i love that stocking and i wish i could snuggle up in that amh flannel! oh my gracious! I think your quilting is splendid! It's a brilliant finish. 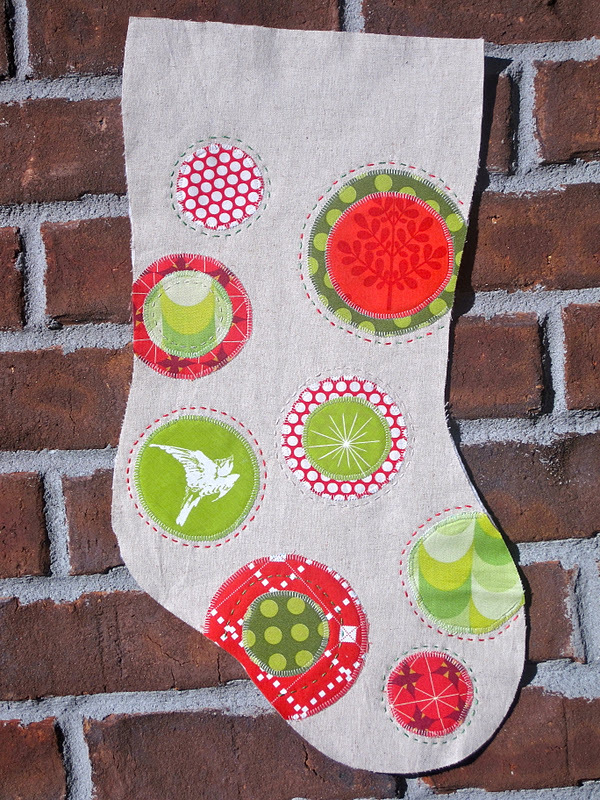 And yep, I'm in love with that stocking (in-progress)! I may die an early death, but I'll get way more quilts finished by spray basting! Great finish and I love that stocking! Whoa whoa whoa! I am behind a few days. I thought you were just going to send the quilt top for me to finish!! You are too much!! !